Many of the stages on Tour du Mont Blanc have alternate routes. The alternate route usually consists of a higher altitude climb taking you closer to glaciers and beautiful views. Today was supposed to be one of those days, but due to the continued rain and inclement weather, we had to settle for the Bovine trail. Getting to the Bovine trail is fairly straight-forward. For a few miles we walked on or along the asphalt roads on our way out of town, until we reached the steep dirt paths marked by the TMB signs. Up to this point, we had walked in quite a bit of mud and rain, but nothing prepared us for the slosh and stickiness of a soaked trail churned to putty by cow hooves. Mix in a little bit of their excrement, and you have a winning combination. The climb was fairly steep in places and was made difficult by the lack of traction. The limited views did their best to help make up for it. The ambiance of ringing cowbells worked as an out of sync metronome, matching the unmeasured pacing of our feet sliding on mud. Eventually, the grade leveled out, and the mud was replaced by a few inches of running water. We both took this as an opportunity to clean our trail shoes off. It was a futile act, but nonetheless a therapeutic one. Caked mud can add a lot of weight to ones shoes, and it was nice to walk with lighter strides if only for just a short while. 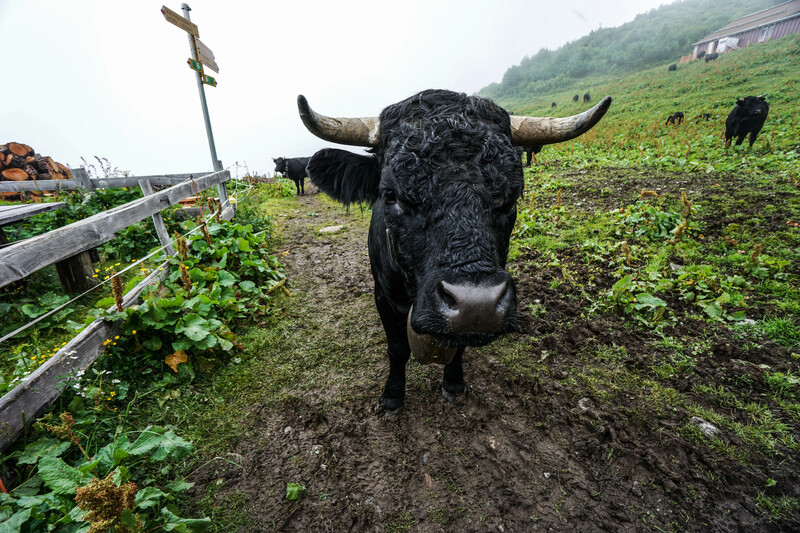 Eventually, we finished the climbing and made it to the Alp Bovine. The hike downhill was equally muddy, but to our surprise, the sun decided to join in on the fun. Judging by the weather report, we knew it wouldn’t last long. By the time we arrived to Trient, the dark clouds had all subsided, the sky was blue, and 93 million miles away, the sun warmed our bones. It was a just reward for the last few days we had endured. Hi there, I’m in the final stages of planning our trek and came across your awesome blog. Question for you, Do you think it is possible to hike from champex to Argentiere in one day? I really don’t want to stay in Trient. My husband and I are seasoned hikers and have backpacked up to 16 miles with elevations of 13,000 ft. We live in Colorado at 7,000 ft so altitude won’t really be an issue. I’ve just been reading so many bad reviews on all the options in Trient. Also what dates did you hike? Hello, it really depends on the weather. On a nice day, I’d say it is possible if you’re physically ready for it. We had originally planned to do that, but with all of the rain and muddy trails, we had to slow our pace considerably. Trient only has a few accomodations, and none are that great as you say. We hiked the first week of July and had rain on ally but 1 of our trail days.